Before there was the SQL Maintenance utility, back in the old days, the former Great Plains Software provided reams of text files containing scripts to recreate any missing or damaged system and/or company database object. These scripts could be found on the installation CDs and could be accessed via the old SQL Server Query Analyzer tool. All you needed to do was to open one of script files, do a search for the desired stored procedure, copy and paste into Query Analyzer, and execute the script against the appropriate database. This sounded simple enough until system administrators (we will not call them users for fear of retaliation :-) ) began corrupting the script files and introducing their own code... It was funny, because Great Plains Support used to asked as part of their support script if you had modified X or Y stored procedure for the problem you were calling for. When Microsoft took over, came the MSIs and the script files were no longer provided. Now what? 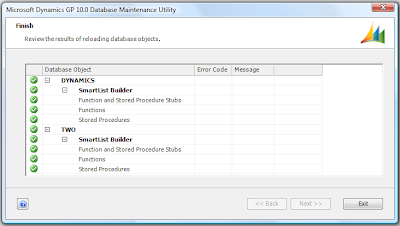 There comes SQL Maintenance, however, the set of utilities provided with SQL Maintenance did not allow you to recreate stored procedures, functions, or table triggers. These still had to be obtained from Microsoft. I guess, in the end they figured out it wasn't worth the hazzle and delivered Database Maintenance Utility. So, lets take a look. 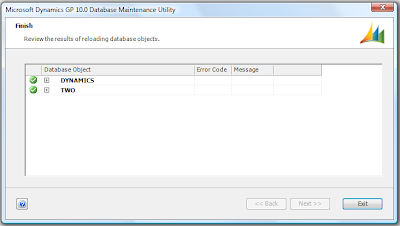 1) Launch Database Maintenance Utility. Go to Start > Programs > Microsoft Dynamics > GP 10.0 > Database Maintenance. Select your server and select an authentication method. Fortunately, Database Maintenance can use Windows Trusted Authentication. Click Next to continue. 2) Choose the company you are going to perform the updates on. My personal preference is to choose ALL databases if you suspect a damage on a stored procedure, function or trigger. Why? Chances are, the stored procedure may be damaged across the board. 3) Select the product for which you will like to rebuild its objects. For this example, I will use SmartList Builder. 4) Mark the objects you would like to recreate. 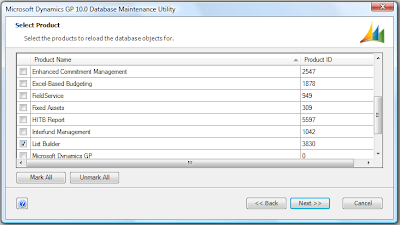 You have the choice of Stored Procedures (includes UDFs too), table Triggers, and Views. 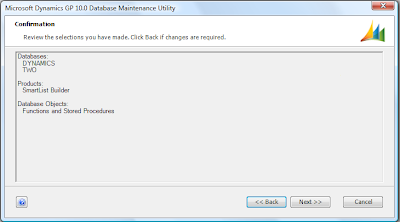 Note that for Tables and table Auto Stored procedures you must use the SQL Maintenance option available within Microsoft Dynamics GP. Click Next to continue. 6) The Utility will run through a progress bar and will return a status of the operations when completed. 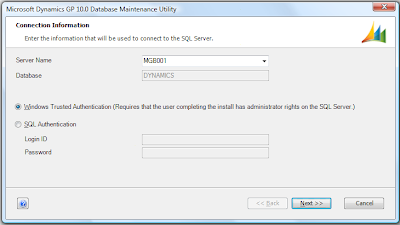 If recreating stored procedures, the Database Maintenance Utility will re-grant permissions to all database users in the DYNGRP role, so no need to run the GRANT.SQL utility script. 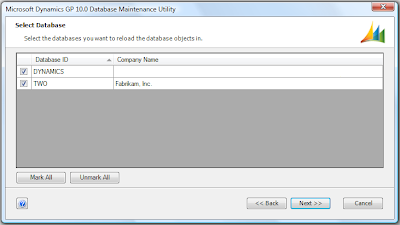 Hopefully, you use this powerful tool as a first option in recreating any missing or damaged database object, before you call Microsoft or open that support case. Thanks alot Mariano for your time and great posts. 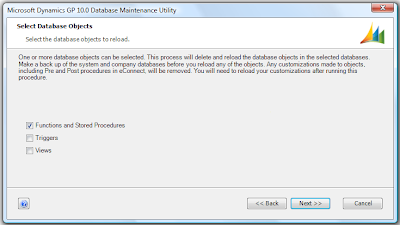 Recently eXtender installed, eConnect extender stored procs missing, ran Database Maintenance Utility. It is not re-creating missing stored procs, but I can see those stored procs in TWO before I scrip it and run it manually, any advice is appreciated. We are having the same issue with a missing company database. Did you ever get a resolution? Thanks! I had two different service packs. Rookie mistake, but this article helped. I am trying to use this utility after moving my GP 2010 installation to a new server but I get the following error "failed to load GPDicVer.dll".